Oriented strand board lines every wall, floor and ceiling inside this residential barn extension in Norfolk, England, by London studio Carl Turner Architects. Black-stained timber clads the exterior of the gabled building, named Stealth Barn, and it sits perpendicular to a larger brick barn that the architects previously converted into a residence. The interior is divided into rooms that allow it function as a guest house, although the clients also use the barn as a meeting place or studio. 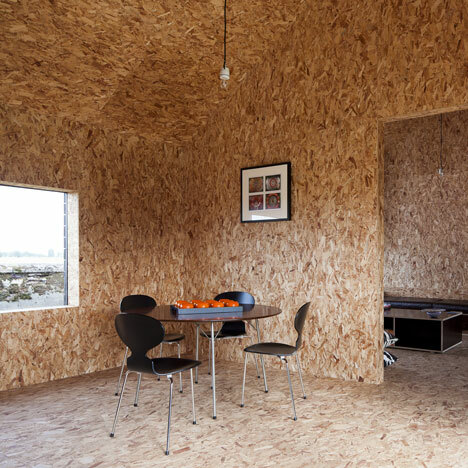 The OSB surfaces are intended to be reminiscent of the straw bales that fill the barns of many farms nearby. Another project we've featured from the agricultural landscape of Norfolk is an extension to a mill-keeper’s house - see it here. Photography is by Tim Crocker, apart from where otherwise stated. Stealth Barn is a project that sits next to and complements Ochre Barn, a large threshing barn converted by CTA to a home and studio. This addition was to provide a self-contained unit that could equally act as a guest house, studio or meeting place, depending on time of year and workloads: a retreat, but also a place of inspiration, enjoyment and a place of work and home without compromising the experience of either. Sitting in the exposed expanse of the Cambridgeshire fens, it is a bold, simple form, reminiscent of the barn it accompanies. Placed perpendicular to the existing barn, it stands to create and define a slightly more sheltered and casual garden which melts into the fens. This clear and simple move also hints at the memory of a former farm yard. Stealth Barn pays respect to the form of the agricultural context but contrasts with the traditional barn. Stealth Barn is a sharp black mass – a shadow of the adjacent barn or a silhouette on the horizon. It is a robust exteriorwrapped with a restricted palette, devoid of fussy detail, and formed to withstand its exposed position. On the interior, this toughness is inverted through the inclusion of a warmer OSB; it wraps fully around the space to form angles reminiscent of the adjacent barns divided with straw bales. It also creates an immersive interior landscape with spaces simply disected in a semi open-plan manner to create compartments. Each room has aspects overlooking the fields which, although open, are very much seen through and out of this interior, providing a sense of protection and warmth. The arrangement of the main spaces into simple pockets is key to facilitating the barn’s multifunctional use - for it to become both a bedroom and a meeting room, a dining room and a studio space. It can be all of these things equally without ever feeling overly domestic or of business. Stealth Barn is a project instigated and overseen by Carl Turner Architects. We have acted as developer Architects and, in turn, the project has allowed the office scope to experiment, learn and test ideas. It was completed at the end of August 2011.